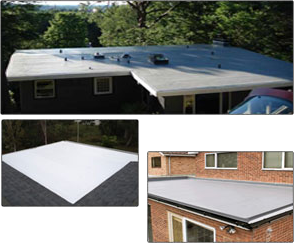 There are several types of roofing systems available for residential flat roof applications. Single-ply membranes such as EPDM. Each roofing system has its own performance characteristics and distinct advantages. All City Contracting works extensively installing, maintaining and repairing these roof systems. We've acquired a vast knowledge and expertise on the ins and outs of each roofing system. This knowledge, coupled with experience, enables us to evaluate your homes roofing characteristics and effectively recommend roofing solutions which meet your needs.